A 16" x 20" unframed open edition paper print by artist Nathan Greene. This beautiful fine art print is unframed. This item ships flat in an art box direct from the publisher. We are authorized dealers for this inspirational artwork. Christian artist Nathan Greene's gift for accurate detail rendered in luminous color shines in this powerful image entitled For I Was Thirsty. This beautiful fine art print depicts the true story of Confederate Sergeant Richard Kirkland during the Civil War battle of Fredricksburg. After a fierce battle on Dec 13, 1862, the scene shifted from heavy fighting to intense suffering. Sergeant Kirkland decided to do something about it. After being ordered not to enter no man's land by his commanding officer, General Joseph Kershaw, Sergeant Kirkland convinced the general to change his mind, and allow him to help the fallen Union enemy soldiers crying for help. Sergeant Kirkland's heroic act is a perfect example of the spirit of service noted by Jesus in Matthew 25. For I Was Thirsty captures the pathos and emotion of this unselfish act of service, and serves as the second visual illustration in Artist Nathan Greene's Matthew 25 collection. This beautiful paper print is ready for you to frame. We recommend using conservation framing methods (acid-free mats, UV protective glass). This quality reproduction captures the richness and depth of color in fabulous detail. We are authorized dealers for this art piece. Please be sure to check out our other listings for Nathan Greene's Art! We are now liquidating our vast inventory of art prints and canvases direct to the public at bargain basement prices! 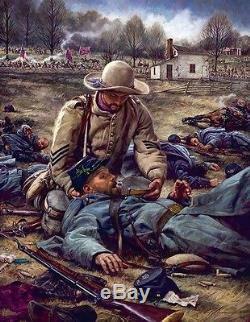 The item "Nathan Greene FOR I WAS THIRSTY Civil War Soldier Battle 16x20 fine art print" is in sale since Tuesday, January 28, 2014. This item is in the category "Art\Art from Dealers & Resellers\Prints". The seller is "artcatalog" and is located in Durham, North Carolina. This item can be shipped to United States, to Canada, to United Kingdom, DK, RO, SK, BG, CZ, FI, HU, LV, LT, MT, EE, to Australia, GR, PT, CY, SI, to Japan, to China, SE, KR, ID, to Taiwan, ZA, to Belgium, to France, to Hong Kong, to Ireland, to Netherlands, PL, to Spain, to Italy, to Germany, to Austria, RU, IL, to Mexico, to New Zealand, PH, SG, to Switzerland, NO, SA, AE, QA, KW, BH, HR, MY, TR, BR, CL, CO, CR, DO, PA, TT, GT, SV, HN, JM.